"Pearls and Swirls" Earrings with a variety of crystal color accents. (looking for a color not shown here? just ask and I can make them). Freshwater pearls and pink crystals with silver plated wire hand twisted in curling patterns. Freshwater pearls and turquoise crystals with silver plated wire hand twisted in curling patterns. 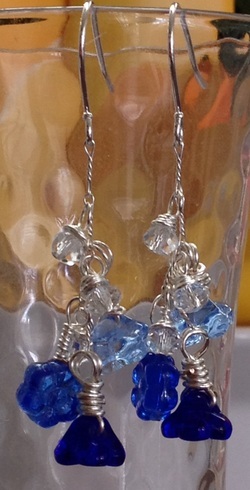 Freshwater pearls and cornflower blue crystals with silver plated wire hand twisted in curling patterns. Freshwater pearls and black crystals with silver plated wire hand twisted in curling patterns. ﻿ Turquoise Wood and Czech crystal earrings. Mauve Czech crystals with silver plated flower accents. 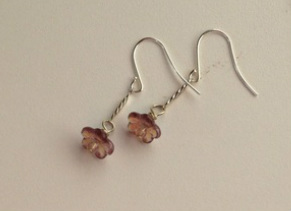 Mauve Czech Flower bead earrings. 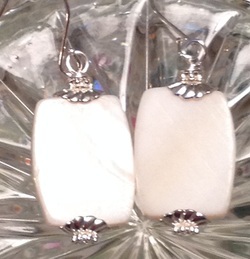 Silver Plated Mother of Pearl Earrings. Creamy White. These rounded rectangles capped by just a touch of silver and a pearly sheen will go with everything. 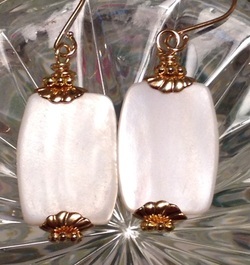 Gold Plated Mother of Pearl Earrings. Creamy White. These rounded rectangles capped by just a touch of gold and a pearly sheen will go with everything. 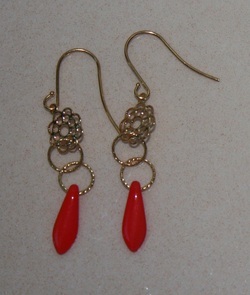 Red Coral Drops - round and flat - with coral and silver plated accents. 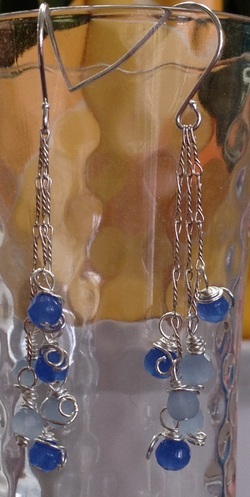 Blue and White Agate stone earrings. 1 of a kind for this color combination. In colonial times a pineapple on a spike in the front yard meant that the merchant captain was back from his travels, accepting visitors, and ready to share his goods. Today the pineapple is a gracious symbol of welcome and hospitality. 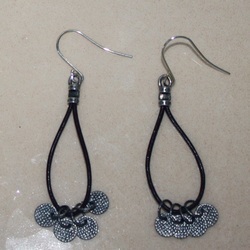 Crystal Tear Drop Earrings with black crystal accents and silver hooks. Intricately carved center bead with a silver plated swirl dangle. Green and tan stone disks with gold plated accents. Intrigued by these stones? Find necklace and earring sets in a variety of natural colors on the "Necklaces" page under "Semi Precious stones and pearls"
Black Leather Hoop Earring with Antique Silver Plated Textured Discs. These are light and fun to wear. Just a little bit of jingle. 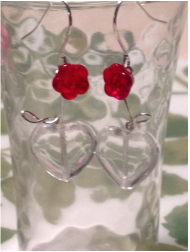 Red Coral Dangles with red glass and silver plated accents for a bit of sparkle. Limited Edition - only 2 avail. "Red Creek Jasper" - red brick colored stone earrings in a flat rectangle shape with gold plated accents. Brown Leather Hoop Earring with Antique Gold Plated Textured Discs. These are light and fun to wear. Just a little bit of jingle. 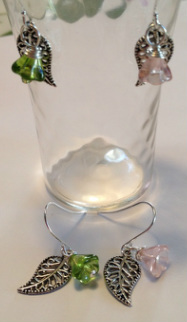 Czech crystal Art Beads with Sterling Silver Hill Tribe Flower Dangles. Czech Crystal Dangle Earrings with silver plated hand made links. Gold Plated Swirls, a clever twisted gold plated bar, and Freshwater Pearls give you a modern and elegant earring. Beautiful pale amber colored Carved Czech "Swallow" beads suspend an adorable silver plated bird charm that has great detail. Red Czech Flower beads (large and small) suspend hand embossed and painted leaves. Silver plated swirls, Freshwater Pearls, and a Cute Fish Charm make up these fun Earrings. Beautiful Amber colored Czech "Swallow" beads suspend an adorable silver plated bird charm with great dimension. Snowmen & Angels - These can be made in Silver of gold plated accents, most any color Czech crystal, and in Hook or Clip versions. Great Little Gifts or Symbols of Holiday Cheer! Freshwater Pearl Snowmen (or women) with pink Czech crystal scarves and open arms for hugging. I can make the scarves in most any color (cobalt, pale blue, blue grey, green, gold, clear, black, pink, mauve, etc) , change the accents from silver plated to gold plated and I can make them in Clips. These are adorable for you or as a gift. They come in a beautiful cloth bag - no need to wrap! Gorgeous Angel Earrings can be changed to any color Czech crystal you like, from gold plated to silver plated, and from hooks to clips. These are so cute - I just love the hair and little halo. They make great gifts and come in a beautiful cloth bag ready to go - no need to wrap! These gorgeous Czech flower and crystal beads in various shades of blue are suspended by a Sterling Silver chain. 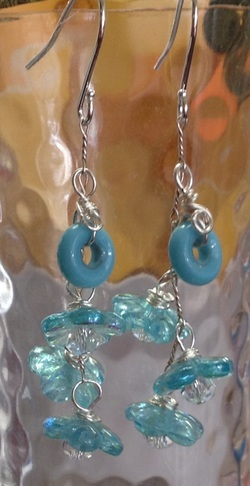 Delicate glass beads in shades of blue wire wrapped with loopy swirls suspended on Sterling Silver chain. These beautiful Czech flowers will make you dream of spring. SO Brown Leather Hoop Earring with Antique Silver Plated Textured Discs. These are light and fun to wear. Just a little bit of jingle. Blue Leather Hoop with Earring Antique Silver Plated Textured Discs. These are light and fun to wear. Just a little bit of jingle. Clear Czech Crystal heart and Silver Czech crystal flower suspended from a silver plated earring hook by a wire worked petal and stem. Bright Orange Czech Crystal spears dangle from twisted gold plated rings and a gold plated flower cutout on gold plated earring hooks. Each paisley curves toward or away from you depending on how you wear the pair. Current flower colors available are: green, pink, frosted white, and black. 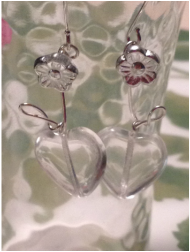 Silver Plated Heart Key Earrings with Czech flower beads. These light weight medallions add a little fun and sparkle with the Swarovski crystals. Each Pale Blue Czech glass flower has texture. They make me think of spring. 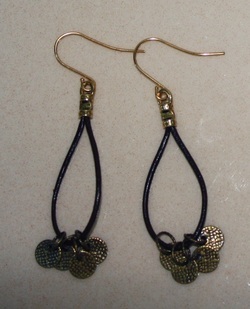 Black Czech flowers and carved Black leaves with gold highlights. 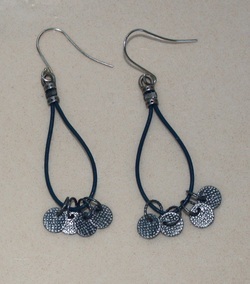 Czech Crystal Flower bead with Dangling Twisted Silver Plated bar on silver plated earring hooks. Available in a variety of colors and without the dangling twisted bar. Bright Green Czech Crystal spears dangle from twisted gold plated rings and a gold plated flower cutout on gold plated earring hooks. 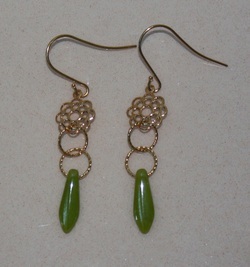 Gold "Mille Fiori" ( meaning a thousand flowers) bead earrings accented by Czech crystals. Gold Plated hooks. You can even see the scales on these adorable Czech luminescent green fish with a silver plated shell dangle. These unusual Czech glass beads remind me of computer chips. 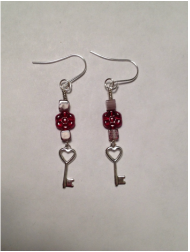 Red and White "Mille Fiori" (a thousand flowers) accented with red Czech crystals on silver plated hooks. These "Mille Fiori" (or a thousand flowers) beads remind me of a daisy. Gold plated hooks. Mauve Czech Flowers and carved leaves. These Czech glass flowers are gold on the top and silver on the back. The carved leaves show a pale hint of gold through the glass. Cobalt Blue Czech glass flowers with clear Czech carved leaves that have the palest gold hint sprinkled throughout the leaf.